BBC NEWS | UK | Magazine | The ultimate hangover cure? 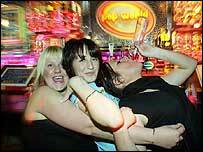 Alcohol sales go through the roof at this time of year, as do those of supposed hangover cures. 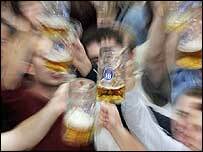 But the holy grail for revellers is a panacea that prevents damage in the first place - could taurine be the answer? 'Tis the season for hangovers. Over the Christmas and New Year period, beer sales peak at almost 4 million barrels and unsurprisingly, sales of aspirin, Paracetamol and other alleged hangover remedies follow suit. But there is a substance that may prevent damage being done to a drinker's body in the first place. Taurine has long been used in household goods, but has shot to prominence as the ingredient that adds kick to energy drinks such as Red Bull or Lipovitan. It is also found naturally at lower levels in seafood and is manufactured by our bodies. The safety of this colourless, crystalline substance in combination with caffeine - as it is in energy drinks - has been the subject of much controversy. After the launch of Red Bull, there were reports that three people in Sweden died after drinking it, although a definitive link has not been proven. Erring on the side of caution, the Swedish National Food Administration issued a warning advising consumers to avoid drinking it with alcohol or after heavy exercise. France banned it, Norway classified it as a medicine and for a long time it was only available in pharmacies in Japan. But scientists studying the effects of taurine on liver toxicity beg to differ. Researchers at the University of London's School of Pharmacy say taurine can reverse the liver damage caused by alcoholism or even a heavy night's drinking. When we drink to excess, fat builds up in the liver, causing it to swell and reducing blood flow to this organ so vital in breaking down the toxins alcohol. Even one night's over-indulgence can cause fat to accumulate. But some studies have found that taurine not only prevents this, it can reverse it. At about the same time as Red Bull and vodka became a popular tipple in the UK, toxicologist Professor John Timbrell was investigating how taurine can protect the body. "It plays a role in digestion and the nervous system, amongst other things, and has been used to treat heart failure and diabetes. We make it naturally but cats would be severely ill without it in their diets because they cannot manufacture it themselves," he says. To see whether it could also protect the liver, his team gave rats alcohol and taurine for a month, and found that it prevented fat build-up in the liver. Even more surprisingly, when given to rats after they had drunk alcohol, taurine continued to reverse the liver damage. "According to our study findings, it is possible that adding taurine to alcohol during drinking could help to minimise liver damage and ward off a hangover, although we need to carry out further studies to confirm the effect in humans," he says. Scientists in Ireland found a similar effect in children suffering from fatty liver due to obesity. The next step researchers hope to take is to trial taurine in the many livers discarded because they are too damaged for donation - but there is resistance from funding authorities who feel that such work may encourage irresponsible alcohol consumption. The hope is that taurine might eventually be used to treat alcohol-related problems. Professor Chris Day, specialist in liver medicine at the University of Newcastle upon Tyne, often treats fatty liver patients. The condition is increasingly common due to binge drinking and to the rise in obesity - he estimates it affects about one-fifth of the population. "It slows down the functioning of the liver and if left untreated could eventually lead to cirrhosis, liver failure or liver cancer. About 6% of alcoholics die from these problems," he says. Short of advising patients to abstain from alcohol and lose weight, there is little else that a doctor can do to treat fatty liver. Taurine would be the first treatment of its kind, if proven to be effective in humans. In fact, the trial on obese children found taurine to be effective in treating fatty liver irrespective of whether the children lost weight. The results are encouraging for those keen to minimise the harm the festive season inflicts. And when it comes to damage limitation, perhaps a taurine-rich energy drink might be just the thing with which to toast the New Year.